In a recent mock draft, NFL.com’s Daniel Jeremiah has the Buccaneers selecting Tennessee Volunteers running back Alvin Kamara with the 19th overall selection in the NFL Draft’s first round. This early entry Junior has been on my radar and on my list of prospects to look at, but this news jumped him right to the top of the list as guys I needed to get familiar with. It’s always a bit harder to evaluate a player when someone as well-known and respected as Jeremiah has chimed in with some of his own thoughts, and I’ll freely admit to being a big fan of both DJ and Bucky Brooks as they bring the scout’s eye to the NFL Network and their “Move the Chains” Podcast. I’ve done it however, and what you see below is my honest to goodness evaluation of Alvin Kamara and how he could potentially fit into the future of the Bucs franchise. The Bucs can’t rely on Doug Martin any longer; Kamara is a three-down back who would fit perfectly in this offense. A true one-cut back who will excel behind a strong offensive line, but may struggle if he doesn’t get the lanes he needs immediately. Capable of becoming a receiver in formation or out of the backfield with limited success, and is best used in the screen game where he can operate in space and get up to full speed with blockers in front of him. Suffered a knee injury in his freshman season at Alabama. Suffered multiple knee injuries in 2016 against Alabama which led to his missing two weeks during the season. Suspended twice by Alabama for “behavior reasons” the first time and for unknown reasons prior to the 2014 Sugar Bowl. Arrested after being pulled over in 2014 for driving without a seatbelt and it was discovered Kamara was driving with a suspended license. Role player who will see action on passing downs and as a change of pace back against teams stacking the box to stop the power run game. Potential special teams contributor who could find his way into a 1a type role in the right system. Starter potential growing into a three-down role if knee injuries don’t derail his career early on. Speed will be his knockout punch, but foot work through camps and practice along with good film study should turn him into a well-rounded player who can become a feature back as long as the team isn’t a run-first offense. By declaring as a Junior Alvin Kamara put the finishing touches on a collegiate career which was expected to reach the stratosphere, started with a whimper and ended without much fanfare. 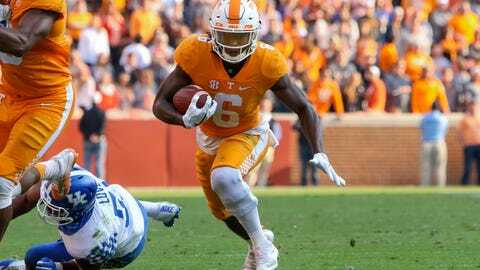 Out-gained by fellow Tennessee running back John Kelly despite getting the majority of carries, the Junior was more dominant in the passing game as he hauled in 40 catches for 392-yards on the season with four receptions going for touchdowns. As a runner he’ll need an offensive line ahead of him to open lanes and seal the edges for him to gain positive yards as he shrinks at the line when meeting defenders and rarely gets out of backfield contact. Once in space, he has the agility to make a man or two miss with some well-timed cuts when he stays patient enough to let running lanes develop ahead of him. Has struggled at times with ball security including multiple fumbles against Texas A&M and dropped passes against Nebraska in the 2016 Music City Bowl. He’s an adequate blocker, but will need to get better at technique and strength if he’s going to become an every down back who can pass protect when needed. As a receiver his route running ability is less than stellar but good enough for a running back playing the role of receiver on an occasional basis. His hands are better than most and his burst following the catch can take advantage of some defenders caught off guard once he secures the pass. Kamara can exploit bad tackling, but will rarely make a defender miss using his own pure talents. As a prospect, the former Alabama commit is best suited being teamed with a more powerful main back as he can come in to change the tempo or give his quarterback another option in second-and-long or third down situations. He does possess middle tier power himself and could have the ability to score some goal line runs between the tackles when defenses play too wide to protect the edges against his speed. The upside for this player with the Bucs is that he has an ability to impact the passing game in ways other Bucs’ running backs don’t. He’s faster and quicker than Charles Sims, and is a more effective receiver than either Doug Martin or Jacquizz Rodgers at this point. Not a starter, but a young man who could find a niche if Tampa takes a chance on him.